Does the amount of copper on this one justify the eventual step up to X58? It's fairly hilarious to observe manufacturers' attempts to justify the prices of X58 boards. 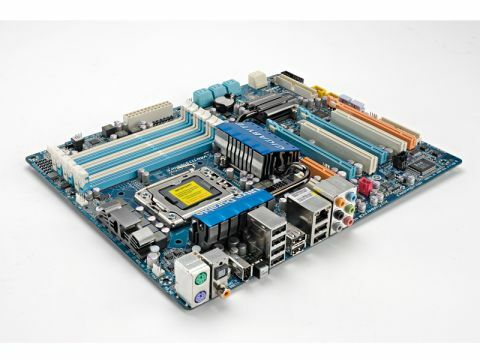 Gigabyte scream about how much copper is used on this board and that the capacitors are Japanese. Woo. Was the row of LEDs really necessary? Nevertheless, it's a cool-running, well laid-out board with triple GPU PCI-E 2.0 slots that still falls at the cheaper end of the X58 scale. With the UD5 and Extreme models waiting above it and the UD4 below it, this looks like the best bet of the range and one to keep an eye on for price-drops in coming months. In terms of performance and features there's not much to define it from Asus's P6T Deluxe, but it's definitely the looker of the two.